Marisa Bourgeois warned Kellen that the Salt tides are ever moving, ever changing, their melody dark and deep. There is no escape for the poor souls drowning in their wake, and he is one of those unfortunates caught in its deadly sway. Kellen doesn’t believe in ridiculous prophecies though. A Selkie slave, forced to fight for his life and the enjoyment of others, he has faith in himself and his ability to overcome any obstacle. He’ll do anything to regain his freedom, murder included. ​What Kellen doesn’t know is some prophecies are real. That an ancient and nameless voice, long Salting away in secret, might indeed be singing of his fate...and it doesn’t care what Kellen believes. Kellen dropped his kill to the bloodied sands and roared to the crowd. Kellen whipped around, yanking Tieran along with him. A sharp pain grazed the side of his neck as a spear’s edge whizzed past. The spear thunked beside him in the sand, its tip buried deep, the other end vibrating. Kellen growled at the spear-thrower – a girl around his age, the lone remaining survivor in her group. You should have kept hiding. He slithered toward her, his adrenaline surging when she backpedaled in retreat. Kellen hissed to keep her from realizing Henry and Marrero had taken the opposite bank, blocking her escape. The girl drew a knife from her boot. Kellen stopped at once, feeling his chain slacken as Tieran obeyed the call as well. So too did he see Marrero stand down. Still, Henry’s mace continued whirring. I don’t have to, Kellen thought, seeing Henry stalking up on the girl. The fire in her eyes vanished as Henry’s mace connected with her skull. The blow sent her reeling, painting the air and sand alike red. Kellen searched their faces, not finding his master anywhere among the audience. He glanced away from their joy and looked instead on the girl’s body. You almost had me, he thought, watching her convulse in death’s throes. Almost. The horn sounded a third time and several owners spilled into the pit, the gatekeeper Roland in tow. The mixed group of owners swam toward the island, their tails morphing to human legs as they rose from the water and stepped upon the beach. Henry turned his back to the owner and knelt at the shoreline, cupping his hands in the water and splashing his bloodied face clean. “Not in any respectable arena.” The owner shrugged away from Roland and stalked toward Henry. Stand up, Henry, Kellen thought. Henry did not, continuing to clean his body of sand and blood. “I said get up!” The owner kicked Henry in the back, sending him into the water. Kellen sprang forward, red swirling in his mind. He dove at the owner’s chest, the force carrying both of them into the water and dragging Tieran along with them. The owner’s hands clawed for him, finding no purchase. “Get off him!” Tieran pulled Kellen back, his chain tugging at the end of his collar. When the owner’s leg changed to a dolphin tail, Kellen kicked hard with his hind flippers, lashing out again toward his opponent. He bit deep into the owner’s shoulder and tucked his head, allowing his wake to carry him past, spinning both of them. Now let him go, Ishmael’s voice commanded. Release him. Kellen relented, leaving the owner to bleed. The tug of his chain called him toward the shore, where he exited the water to further applause. Ishmael had joined them in the pit, standing next to Roland, and he made a show of frowning as his fighters traipsed onto land. Lies. Kellen knew Ishmael’s expression. He couldn’t be more thrilled with us. “And yet you’ll have neither,” Ishmael replied. 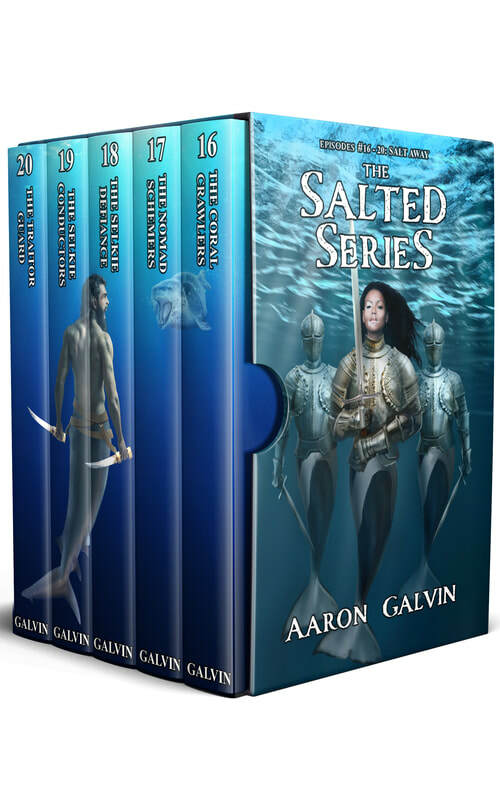 He patted his thigh and waved Kellen to approach, stroking his seal head the moment Kellen joined him. He’s never stood in the pit and faced his death, Kellen thought, when the owner blushed as he waded back to shore, holding his wounded shoulder. Not like me. He glanced to his companions. Not like us. “Very well.” Ishmael snatched up a spear and skewered the largest owner. Kellen tensed as Ishmael engaged the others. Kicking the first away, Ishmael grabbed two more owners by their throats and lifted them off their feet. He knocked their heads together and allowed their limp bodies to drop. Now you know. Kellen watched as Ishmael plucked the spear from his first kill and approached the skewered owner. Stomping on the owner’s chest to keep him in place, Ishmael spun the spear in his hand and drove the tip down, staking his opponent through the neck. We’re Salted...hardened, Kellen thought as he listened to the skewered owner’s last garbled breath. You’re not. The wounded Merrow had gone, vanished beneath the water. The crowd turned silent as all waited with bated breath for the Merrow to make itself known. Its silvery back broke the surface moments later, its blowhole exhaling giving its presence away. And now you die too. Kellen stood by as Ishmael dove into the water. He searched the spot his master had entered, waiting for him to emerge again. Ishmael did not, nor did the Merrow. Kellen backed farther up the shore, retreating from the ever-expanding pool of crimson. That’s how he earned the name. The thrashing relented, but the crimson hue would not give sway back to the blue. Kellen stared on, conflicted as to whether he should fear such brutality or emulate it in future fights to gain the hushed reaction from the crowd. The chain around his neck pulled at him. The growl in Kellen’s throat died when he saw not Tieran yanking at him, but Roland. Kellen tore himself away from the scene and galloped to the ramped pit exit with Tieran in tow. At the crowd’s applause, Kellen glanced back and saw Ishmael’s triangular dorsal fin breaching the surface, circling the island in shark form. Kellen opened his mouth for equal treatment when Roland came for him next. The familiar changes from seal to human took hold of him and Kellen stood, barefooted, a moment later. Kellen latched onto Tieran’s wrists, trying to break his grip. He glared into the madman’s eyes. Kellen rocked back and whipped his left leg up. Catching his heel against Tieran’s nose, Kellen wrenched Tieran backward and off of him. The grip around his throat broken, Kellen sucked air while keeping Tieran locked between his legs and raining fists on Tieran’s face. Still gasping for air, Kellen lifted his hands in acknowledgment that he would fight no further. Tieran groaned from the floor, his face a bloodied pulp. Serves you right. Kellen thought of Tieran as the guard led he, Marrero, and Henry back to the slave quarters. The other fighters banged their fists against the bars, welcoming them home. Kellen did not acknowledge any of them. All three companions entered their cage without a fuss. As had become their custom, each distanced themselves from the others by taking separate corners when the lock clicked home. Calm down. Kellen sat on his heels, his back pressed against the wall. He closed his eyes and took several deep breaths. Calm down before Ishmael gets here. Henry met his master’s stare, but said nothing in his defense. Ishmael reached through the bars and yanked Henry against the bars. Kellen licked his lips as his mind searched for a satisfying answer. “Live or die, then?” Ishmael asked. Kellen watched him stalk away, leaving the three of them to brood. “Hey!” Kellen stepped between them to halt Marrero from rushing Henry. “You don’t know that,” said Marrero. “You are weak,” Henry said. “Why would he care what I think?” Kellen asked. “Then I guess I’m blind,” said Kellen. Marrero tugged on Kellen’s arm, motioning him to follow to the opposite corner. Kellen obliged him, both teens seating themselves in such a way to keep Henry in their sights. I’m better than you, that’s why. Are we? Kellen kept his stare on Henry. And you’re not going to like it. “Yeah, well, I don’t plan on dying,” said Kellen. I’m Salted. Hardened. They sat in silence and took shifts leaning on each other to doze. Each time Kellen nodded off, the twisted faces of those he had slain in the pit fights haunted his dreams. Men and boys trapped beneath dead seals, knowing death came for them, helpless to prevent it, their screams filling his ears. Kellen killed them again and again, trying to shut out the voices, adding his own cries to their own. On and on he fought the nightmares, until only he remained to stand in the bloodied sands. Noooo… a whispered voice uttered from the depths of the black water, ringing the island. You won’t. He regretted it the moment he saw the girl, the same one who had begged him to kill her, her death wound fresh from the dent Henry’s mace had made in her skull. Still she came on, her skin pale and purple as she waded out of the water and onto the shore, her hollow gaze fixed on him. And when she spoke, it was not with her voice, but that of a deep, craggy hag. An icy grip clenched his shoulder. Kellen wheeled about to the dead girl behind him, smiling. “…its melody dark and deep,” she cooed, shoving him backward. His arms flailed in search of a hold, finding none. Kellen crashed into the freezing water, the whole of his body submerged. Fight! He forced his eyes open, spinning in search of the surface, nowhere to be found in the murk surrounding him. Wake up! A blurry light shone from above, dimly revealing a kelp forest all around him. Again, Kellen felt a tickle on the bottoms of his feet. He kicked it away and breast-stroked toward the light. The tickle returned with a vengeance, not stopping at his feet, instead snaking around his legs, ensnaring him further with his every futile stroke to break free. Kellen choked, witnessing his air bubbles rising toward the light. He craned around to free himself and saw what held him fast. It uttered a single word before releasing him. Kellen screamed, fighting with every fiber of his being to escape, clawing through water to reach the surface again. Kellen gasped awake next to Marrero. Gulping down air, his heart thundered against his chest as his gaze frantically swept around his cell, finding nothing amiss. Nothing changed about it. A dream, he thought when Henry gave him an odd look whilst Marrero slept on. Kellen’s head thunked back against the wall. Just a dream. But an hour later, he doubted it, the uttered word from the nightmare haunting even his waking moments.